In the US, stats are everything, they are used to analyze everything and anything, from political polls, to sports, to education to the simplest of questions. 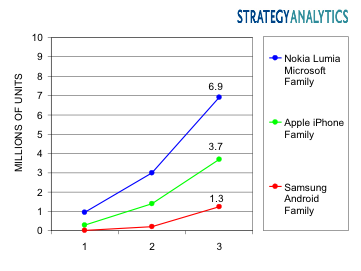 So its no wonder when the stats on how the Nokia Lumia devices did in its first 3 quarters compared to iPhone and Android, that it became clear the WP platform just might be getting somewhere. See, when the iPhone was launched in 2007, it only sold 3.7 million units in its first 9 months of release. The Android devices (Samsung family) sold 1.3 million units in its first 9 months of release. The news today is that Nokia Lumia line sold 7 million units in its first 3 quarter, which is way better than how the dominant iPhone and Android devices did in their first 3 quarters. Here is the chart showing…. So is this stat a big deal? Well, it depends on which angle you are looking at it from, see when the iPhone was launched, not everyone was buying it, it was a new technology, touch screen in your palm, consumers was cautious about getting this new technology, while those courageous enough to try it got one, so it took a while for people to get used to this and today it is the best selling device. Android came along after users became fully used to the touch screen, but the iPhone was the only touch screen phone in the market, so when android came out with its touch screen devices, it wasn’t new technology anymore, Apple thought of it first, people knew what it was already so I reckon that’s why the Android devices didn’t do as well as the iPhone did in its first 9 months. 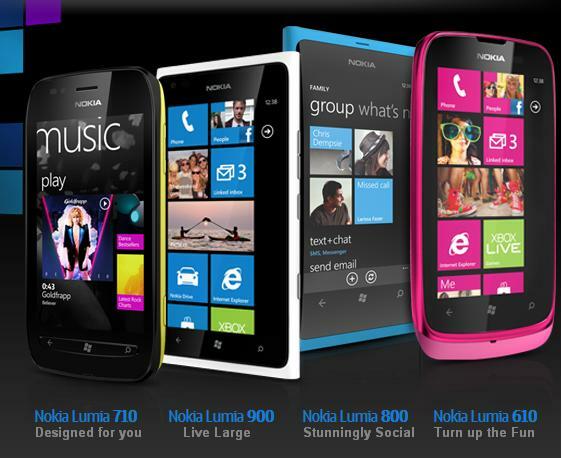 5 years into the touch screen smartphone era and Nokia debuts the new WP7 devices and it sells 7 million units, that’s twice the amount iPhone sold in their time, this is a HUGE deal because we are in a time in the ecosystem where iPhone/Android are dominating, but somehow Lumias outperform the iPhones/Androids, remember the iPhone and Android during their time didn’t have stiff competition, I mean Blackberry were still making their QWERTY keypad phones, and Nokia was still in dreamland thinking it owned the world with its old school Symbian OS. No doubt, the Windows Phone devices have been received well and this only shows how well in the long run they will do, investors know this and that is why Nokia’s stock shut up 13% with the news of Lumia sales.